Startup Weekend is the world’s largest community of passionate entrepreneurs with representation in over 195 cities in 65 countries around the world in 2011. Startup Weekend is a 501(c)3 non-profit on a mission to provide the world’s premier experiential education for beginning and early stage entrepreneurs. Startup Weekend establishes itself as a sustainable initiative within every community it reaches, active on a regular and ongoing basis. By bringing together a powerful mix of communities’ most experienced, creative, and ambitious individuals from a number of industries, Startup Weekend has become an integral element in catalyzing and building healthy startup communities in an organic and grassroots way. In 2010, Startup Weekend continued to rapidly expand into new cities while also returning to established startup communities. In repeat cities there is a healthy mix of alumni and new participants. Many attendees, whether new or experienced, come in order to meet fellow entrepreneurs outside of their daily networks. In order to capitalize on opportunities for active networking across industries and levels of experience, Startup Weekend actively manages recruits equal ratios of entrepreneurs with business background and those with technical backgrounds. All attendees benefit from hearing speakers, working with local mentors, and receiving feedback from judges (though leaders and experienced entrepreneurs). Both the attendees and the more experienced participants are members of the local startup community. The environment during a Startup Weekend is one of openness, collaboration, and education. It embodies the paradigm shift taking place in our education system today by emphasizing the power of collaborative, hands-on learning utilizing real problems and scenarios. All ideas are welcome and decisions are made democratically. No idea is considered unworthy and any team with passion and vision is encouraged to continue working after the weekend, regardless of judges’ feedback. Since 2009, more than 35,000 attendees have participated in Startup Weekend workshops around the globe. More than 850 ventures are still active and of those, several startups have gone on to secure investment and/or funding. Startup Weekend companies are participating in accelerator programs, hiring employees, generating revenue, winning awards, and, most importantly, solving real problems and creating value for themselves, their communities, and the economy. Startups Weekend has helped establish a culture that fosters creativity and innovation in communities around the world. It has become an infrastructural element at the earliest stage of hundreds of ecosystems. Startup Weekend drives intentional conversations around which elements are necessary to sustain and amplify the momentum of early stage entrepreneurs. Over the last year, Startup Weekend has grown into something much larger than three guys working out of a condo or even the current team in Seattle. It has become a global movement. One that is actively impacting and shifting models of traditional entrepreneurial education. This education goes far deeper than Startup Weekend attendees and has helped foster a cultural change. This shifting education model is fundamentally changing the way even the most experienced businessmen view business creation. Startup Weekend is leading the charge, impacting the development of communities and startup ecosystems at their foundations. Unveiling the mysteries of what it takes to solve real problems and create true value is something the academic world has been attempting to do for decades. Startup Weekend helps harness the raw power of creativity and human potential by empowering individuals and teams to build and validate the solutions to the opportunities and problems they see and feel every day. Through Startup Weekend people are able to pursue their passions and find the people they need to transform their vision into reality, while providing opportunities to learn how to succeed not only on a local level, but with the ability and potential to become a high-growth venture. I’m confident these opportunities will influence thousands of entrepreneurs and contribute to an infrastructural change and cultural movement that will positively impact our communities and ultimately our economy. Two years ago, we had this (seemingly irrational) passion and a dream to establish Startup Weekend at the center of the global stage of entrepreneurship. Having worked in hundreds of cities, and personally experiencing over 50 different startup communities with thousands of incredibly passionate entrepreneurs, I couldn’t be more confident about the positive impact the Startup Weekend model has, and for the future evolution of the model. The world is at a pivotal point right now, re-evaluating models of education and forming policies that will shape and foster new business creation. The members of the Startup Weekend community are leading the way for both-- not by talking about issues, but by solving them from the bottom up and affecting change for all. Startup Weekend has undergone a transformation, beginning as an LLC in 2007 and reorganizing into a non-profit in 2009. The organization grew from the bootstrapping startup of three guys working out of a condo into a company of 9 full-time staff and several part time interns. Most importantly is the community (“family”) of over 240 Startup Weekend volunteers who help organize and facilitate the quality growth of events around the world. 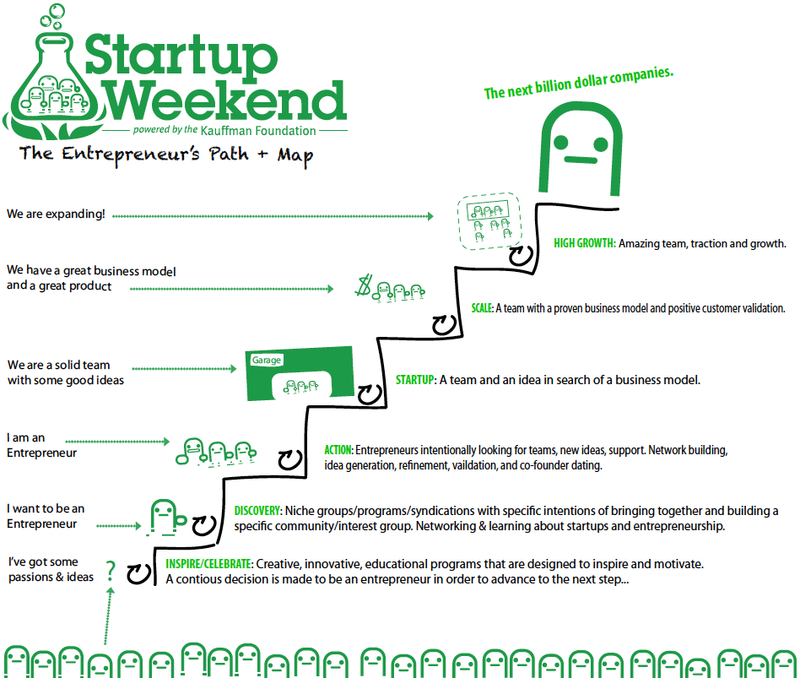 Through the model of open growth, anyone is able and welcome to join the Startup Weekend network. This model has facilitated the cross-pollination and some of the highest level conversations in existence regarding ecosystem building and entrepreneurial development from a grassroots perspective. This program has also evolved into a very intentional form of leadership development training. In a survey of all Startup Weekend organizers and facilitators who have led one or more events, just under 75% report a direct positive correlation to a change in their employment status following their involvement with Startup Weekend. These Startup Weekend leaders are coaching their communities on entrepreneurship and are also the individuals who are leaving their jobs, starting new business, and ultimately, pursing new opportunities and interests. This element of new success and personal development on the part of the Startup Weekend leaders instills into the model a level of sustainability and success that cannot be achieved in a traditional educational environment. Year-to-date, our main revenue stream is ticket sales. While increasing our number of Global Sponsors, we’re also exploring new opportunities for revenue, including newsletter advertising and strategic affiliate partnerships. Developing new revenue streams will continue to be one of the largest focuses of the organization in the coming two years. With an ambitious goal of being fully self-sufficient without any support from the Kauffman Foundation by September 2013, Startup Weekend will continue to develop strategies that target enhanced support from global sponsors as well a high net worth individuals. Startup Weekend continues to be a lean organization, never forgetting its bootstrapping roots. The above graph represents the expense streams that we track internally; however, there are countless thousands of dollars invested in Startup Weekend events indirectly that are not represented. At almost every event sponsors purchase food/supplies directly and make in-kind donations (materials, venues, technology, etc.). Another expense stream not represented is virtually all expenses associated with events in smaller countries, which accounted for about 40 events in 2011. We estimate the additional costs, donations, and payments we do not handle directly to be around $250,000 for the first six months of 2011. With the current grant from the Kauffman Foundation, 2011 saw significant investments in the organizational infrastructure. The focuses thus far for key investments include developing new initiatives and expanding to new cities, building what is possibly one of the most complex accounting solutions and procedures in QuickBooks’ history (for a startup), a fully functional front-end website, a soon to be finished back-end content management system, formal marketing materials and videos, and much effort spent developing and refining the operational tools that are used to coordinate Startup Weekend events around the globe. The remainder of 2011 will see additional investments in the operational infrastructure that will help the organization increase efficiency and effectiveness. Moving into 2012, organizational investments will decrease sharply with larger investments going to curriculum and program development. This change reflects Startup Weekend’s commitment to reinventing the our model and challenging the Core Team and all network leaders to lift organizational quality and support structures as high as possible. Startup Weekend is in a unique position since all of our educational programs are also revenue-generating activities (at least on the event level) and provide incredible sponsorship value. Operationally and philosophically, Startup Weekend is intentionally run and built to be a sustainable business. Startup Weekend serves as an incredible catalyst and foundational infrastructure element for ecosystem development strategies. While Startup Weekend exists predominantly in the web-tech world, the model is tested and more than applicable in just about any vertical imaginable. While much of the growth is passively sought, Startup Weekend is pro-active in a few industries that it wants to contribute to and help lead the development of. Startup Weekend enters new verticals through a process of testing. We have successfully piloted our model around the Education, Gaming, University, Green, Social, and Mobile verticals. In the coming months, new verticals are being pursued in Health, Food, Developing Worlds, Government, Art/Design, Journalism, and Media/Entertainment. During vertical events, participants with experience or interest in the vertical are encouraged to pitch ideas and lead teams. (Non-vertical ideas are still allowed at these events.) For example, in June 2011 Startup Weekend, in partnership with a local collaborative space, hosted Bay Area Startup Weekend: Education. The event was extremely successful: the event sold out a week before kickoff, keynote speaker Eric Reis was extremely well received and 14 teams presented education-focused startup ideas. Given the event’s success, Startup Weekend is currently pursuing a grant from the Bill and Melinda Gates Foundation, which would provide funds for additional education-focused events and operational support in several US cities. As with the Education event, upon the successful completion of any pilot vertical program, the model is refined and set to scale through the global infrastructure of established leaders and influences already established to ensure its proper launch and success. Startup Weekend will actively seek financial support for proven vertical models to establish dedicated operational support to ensure sustainable and quality implementation. Startup Weekend is leveraging strategic alliances in order to make the most of the startup activities in the United States. As of January 2011, Startup Weekend became an official Partner Program of Startup America. As a Partner Program, Startup Weekend has committed to providing and sharing resources with Startup America. Other Partner Programs include organizations familiar to Startup Weekend alumni, such as TechStars and MassChallenge, as well as organizations that support women entrepreneurs, such as Astia and DEMO. Startup Weekend is also a partner with the Global Entrepreneurship Program (GEP), which is an initiative of the US Department of State. Startup Weekend first came into contact with the GEP during Cairo Startup Weekend in April 2011 when the GEP’s Entrepreneur-in-Residence in Egypt attended the event and realized that there were numerous synergies between the two organizations. Startup Weekend and GEP will be working together to promote early-stage entrepreneurship in African countries, such as Tunisia and Egypt, and Southeast Asian countries, such as Malaysia and Indonesia. Most importantly, this partnership will take advantage of each organizations in-country networks so that both Startup Weekend and GEP can mobilize entrepreneurs on the ground and build disruptive, innovative momentum from the bottom up. In June 2011, Startup Weekend met with Dr. Winslow Sargeant, Chief Counsel for Advocacy of the US Small Business Administration’s Office of Advocacy. Dr. Sargeant attended a round table prior to the Seattle Startup Weekend kickoff where he spoke with active Startup Weekend volunteers and participants as well as other local entrepreneurs. Dr. Sargeant also attended the Friday night pitches and mentored teams on Saturday. Dr. Sargeant was so impressed by what he’d seen at Seattle Startup Weekend that, once he returned to Washington DC, discussions for possible future interactions and support between Startup Weekend and the Office of Advocacy are underway. Startup Weekend will continue to grow at a rapid pace in the years to come. Startup Weekend will never say “no” to qualified, ambitious community leaders wanting to join the network. Startup Weekend receives between 3-4 qualified applications every week for new events, of which, 50% of which are applications from organizers in new countries. This trend will likely continue through the second half of 2011 and most, if not all, of 2012. During this period, applications are also expected to see a increased event concentration in existing countries. Startup Weekend aims to do well over 300 events in 2012. With established teams and past events in over 196 cities around the world by the end of 2011, the goal is to ensure that every city has around 2 events a year. The core team will grow only as necessary and as funding permits, which will place additional burdens on the Operations Team. There will be a strategic focus to on establishing more regional operational support and leadership to help ensure the sustainability and quality of our operations. With the continued development of management tools, even greater efficiencies of scale will continue to be realized. With over 450 events completed, Startup Weekend organizers and the Core Team are seasoned experts regarding the best practices to be used over the course of weekend events. The lessons we teach are no necessarily new but we aggregate all the key methodologies and deliver them to Startup Weekend attendees in applicable, easy to use ways. The philosophys and methodologies we teach are as applicable over the course of the weekend as the models used by the best VC firms and most experienced entrepreneurs. With help from the startup world’s leading influences and voices, Startup Weekend has formailized and adapted those materials that have had the most impact on event attendees. These are also the materials and practices that are the most influential to the evolution of good startup ideas. While many entrepreneurs are aware of the leading principles on blogs, textbooks, and classrooms, surprisingly few people have actually put these ideas into solutions for real world problems. Concepts such as Customer Development, SCRUM, Kanban, LEAN, Business Model Canvas and the likes are models advocated throughout the weekend. By taking these theoretical concepts and providing a framework in which the tools are utilized and both alone and as a team, attendees leave with valuable new insights that are sure to be utilized in their future jobs or at future startup ventures, making them more successful. In addition to developing and modifying our curriculum, we are actively experimenting with changes to the Startup Weekend model itself. As mentioned before, ideas are merely a mechanism for connecting and grouping individuals around compatibility, complementary backgrounds and similar interests. There remain further opportunities to facilitate relationship building in quicker and more meaningful ways and we are working to incorporate these practices into our events. More than anything else, our participants ask for a way to keep in touch with their Startup Weekend team members and colleagues after events. Some solutions have been implemented in the past, such as Ning, which failed to sufficiently solve the demand, and generally events settle for Facebook groups. Startup Weekend is currently working on a long-term, sustainable solution that will satisfy the needs of our global alumni network. Before the end of 2011, a new online system, built to highlight the individual, team, and event experience, will be rolled out. This has been a work in progress for almost a year and was developed with endless feedback from the community. The goal is to meet the current needs of our large and heterogeneous community while allowing for growth into a much more robust platform that will provide insight into the science and underpinnings of the actions of aspiring and active entrepreneurs. Startup Weekend continues to develop and evolve its core model and the overall organization to continue to build and strenghten sustainable community of supporters. Fundamental to the Startup Weekend model are several layers and aspects of Gamification theory that we continue to embed and weave into various levels of engagement. Intrigue. Content and story line often represent the consumer tech side. The enterprise needs to develop relevant content to keep users engage. Content could include help topics, related information, user generated comments, etc. Startup Weekend’s brand provides an inherent intrigue and appeal to its target audience. The goal of starting a business in just one weekend is not always attainable, but is still a very real possibility and is encouraged and promoted with support from previous success stories our target audience hears about. One element that must be further developed is a retention strategy. We need to focus on providing more materials, information and user-generated content to keep the community engaged pre and post weekend. Reward. Both non-monetary and monetary incentives can be deployed. Rewards should match level of difficulty so users gain a sense of accomplishment. Non-monetary rewards could include exclusive information, access, or recognition. Those closest to Startup Weekend include the vast network of organizers and facilitators. We provide each with a special set of rewards including Startup Weekend branded track jackets, Moleskine notebooks, personalized Startup Weekend business cards, and even a fancy glass beaker with the Startup Weekend logo to put on a shelf or in an office. Startup Weekend participants receive stickers and event-level swag; however, a technology-based rewards structure is being included to recognize and create incentive for attendees who participate frequently. Status. Leaderboards codify status in gamification. Leader boards reward status and provide a recognition mechanism as well as a way to tier users. A robust analytics platform must align with the objectives of gamification and support reward systems. Again, our facilitators and organizers get special recognition; however, we have not yet developed a public leaderboard. This will be addressed in the coming year though new individual and team websites for each participant. Community. Social is a key part of gamification. Users want to connect, share, and reach out to other “players”. Expect integration back to mobile and social platforms. Startup Weekend is based on an offline world where meaningful, lasting communities and relationships are forged. There is no stronger bond entrepreneurs can build over the course of a weekend than actually launching a business together. This is core strength of the Startup Weekend model. Our online solution will also address and emphasize community energy and needs long past the weekend. Challenge. Users must earn a sense of accomplishment to remain engaged. Gamification in the enterprise should tie back to the achievement of levels with increasing difficulty. Challenges will tie back to reward and intrigue over time. Another strength of the Startup Weekend model is that despite the varying levels of attendee experience, there are always new, intriguing and challenging things to learn and take away from the event. Building a program that helps reward the vetrans and even group them together to help increase the challenge levels will surely continue to raise engagement and performance levels. Startup Weekend is active in more cities and countries than ever before and as the brand awareness continues to grow, Startup Weekend is able to enter smaller, less urban cities. However, regardless of the number and frequency of the venues, it’s inevitable that Startup Weekend will miss some entrepreneurs and startup communities. For this reason, Startup Weekend has written a book. Startup Weekend: How to Take a Business form Concept from Creationin 54 Hours will be published by John Wiley & Sons in Fall 2011. The book is an introduction to the Startup Weekend philosophy and model. Readers are not only introduced to the Startup Weekend story but are walked through a virtual weekend, with all the best practices, lessons learned, and main takeaways explained. Of course, reading the book is no substitute to attending a weekend event, but until Startup Weekend is in every town multiple times a year, it is a great way for interested entrepreneurs to learn more about early stage entrepreneurship and follow actionable steps to further them on their entrepreneurial journeys. Over 150 Startup Weekend participants, mentors, and organizers submitted material for the book. As Startup Weekend has evolved and been recognized for the integral role it plays in bringing communities together and facilitating conversations around further ecosystem development, it has been been drawn into many of the leading conversations about how to develop and grow healthy and sustainable ecosystems. The Startup Foundation is an internal test project, unofficially launched of July 1, 2011, that has allowed Startup Weekend to become more intentional about facilitating the conversations around healthy startup ecosystems development. The Startup Foundation aims to utilize tStartup Weekend’s unique insights to help formalize, unify, and legitimize the voice and the needs of grassroots entrepreneurs in communities across America. More information and leanings will be released in the Startup Foundation’s first formal ecosystem development report, scheduled for publication in September 2011. 1. Deconstructing the investment world paradigm - Most current models of entrepreneurship and entrepreneurial activity revolve around the investment world. It is a well-known fact that only a small fraction of the Fourtune 500 companies ever accept investment and an even smaller percentage do so when they are young firms. This misconception can be found in almost every classroom and model, and it leads to the false expectations of what “success” means for new entrepreneurs and influences the creation of poor policy and practices, both public and private, intended to to help entrepreneurs and new firm creation. Startup Weekend is uniquely positioned to help highlight and build a new paradigm that helps model the actual evolution of most entrepreneurs. 2. Individuals are greater than ideas - Another conversation and current paradigm shift Startup Weekend attempts to address is the current focus around programs and initiatives that support ideas rather than individuals. There are incubators, funding groups, political incentives, grants, etc. all designed to catalogue, facilitate and foster ideas irrespective of the individuals and people behind them. In truth, ideas are a commodity. At Startup Weekend, we see the exact same ideas pitched around the world over and over. Every once and the idea works, not because of the idea itself, but because of the team, their leader, their shared vision, and their superior ability to execute. By shifting the conversation away from ideas and towards the individuals and teams, we can foster foundational initiatives that will educate the next generation of co-founders and teams who will have the resources, tools and understanding they need to execute on good ideas. Imagine if the question“what is your million dollar idea?” never existed and instead was, “who is your million dollar team?”; entreprenuers’ incentives would be more aligned for success. 3. Influence of the creative class - Discussions about the rise and importance of the creative class abound and Startup Weekend is a prime example of an organization illustrating their influence. Segregating various groups of individuals by education level, background, professional focuses or strengths needs to be re-evaluated since it has led to the segregation of communities, curriculum and interests. The realization that most people who start creative, innovative, or disruptive businesses are not actually business or entrepreneurship majors should be more widely acknowledged and understood. The simple fact that a combination of various backgrounds is required to generate good ideas and form successful teams. Ensuring that we continue to build programs that intentionally bring together the makers, the engineers, the business types along with everything in-between, is at the forefront of all of Startup Weekend efforts and may similarly influence other models. 4. Passion Economics - Perhaps the most powerful outcomes of Startup Weekend is the model’s role in helping individuals discover their strengths and passions, and empowering them with the tools and experience so they can turn them into value creating activities. The more people realize the reality of being able to pursue things they are passionate about, the more creative solutions to real problems we as a society will we see. Those solutions will, in time, lead to more new firms and ultimately more jobs, which will contribute to the overall welfare of local and the global economies. This is a very simple philosophy, however, that we need to continue to develop and help others understand it’s value. 5. Ecosystem Specialization - Just as 2011 has seen the increase in the number of incubators and the trend of entrepreneurship itself, we believe that we are seeing a natural move towards a higher specialization of communities. In a landscape of increased competition and dilution, differentiation is a growing need. Each community, sometimes a city (sometimes an entire region), is starting to realize and develop competitive advantages. Ultimatley contributing to a better understanding of entrepreneurship on a micro-level, we will witness a growth in outward specialization in the coming years (branding, strategies, platform, community specialization, etc.). Startup Weekend intents to help communities develop community-wide conversations and support around these topics and help them establish themselves on a global playing field with their corresponding strengths and strategic focuses. 6. Building healthy communities - With experience operating on an intimate level in nearly two hundred various communities, Startup Weekend continues to draw information and insight about early-stage entrepreneurial best practices. We’ve begun to assemble this information into useful research sets, which will be open to the public, in order to generate more productive conversations about ecosystem development. The fundamental focuses of our research activities are contextualizing entrepreneurial activity across four dimensions: individuals, firms, initiatives, and time. As seen in the above diagram, all initiatives and programs can be classified into one of several steps within the context of the evolution of an entrepreneur: Inspire, Discovery, Action, Startup, Scale, and High Growth. This model is inclusive of several concepts listed above and helps to illustrate any ecossytem and its initaitives as they pertain to the creation of entrepreneurs and new firms. Startup Weekend continues to develop and collect data around this model. The expected result is meaningful data and visualizations which will help identify strengths, weaknesses, and best practices of any given community by aggregating the data across communities both large and small, around the world. It will also provide the potential to serve as an dynamic feedback mechanism for placing individuals in startup ecosystems and recommending to them the relevant resources, activities, and individuals they should be interacting with based on their experience, goals, industry, and location. Revenue Streams - Startup Weekend has been incredibly successful by maintaining its “controlled open-source” model in which, as mentioned previously, all qualified community leaders to bring Startup Weekend to their community. This open model is one of our most fundamental elements of success, however, it also poses the organizational challenge of keeping up with the demand. On a global average, Startup Weekend nets just over $1,000. The event-level model is one that Startup Weekend intentionally developed to be as frictionless as possible and will not change moving forward. In order to maintain the integrity of the current model, additional variable revenue will not come from the event-level revenue streams. Given Startup Weekend’s current activity of 200 events in 2011, event-level revenue will be $200,000. We expect another $200,000 from global sponsors, which provides a total operating budget around of $400,000. Current demand requires a team of 10 people to fulfil operational requirements, at a cost of roughly $550,000 before any developmental, marketing, or other operational costs leaving us with a shortfall of roughly $380,000. Currently, this gap is covered through the support from the Kauffman Foundation. Startup Weekend has a goal of achieving sustainability independent of the Kauffman Foundation by September 2013. This will require additional revenue streams to supplement at least $450,000 in annual costs. Alternate revenue streams being developed include the bi-monthly newsletter, which is netting roughly $1,000 per month and affiliate partnerships (with groups such as Udemy) to provide educational content to our community. The projected revenue stream from affiliate partnerhips is roughly $10,000 per year. Another high potential revenue stream under development targets startup-specific job recruitment. Above and beyond the revenue streams listed above, our primary focus centers on securing additional more substantial form of sponsorship. This need poses one of our biggest administrative challenges. Corporate sponsorships are not a sustainable at high volume. With each additional sponsor comes more demands, more KPIs and another set of operational challenges, which in a lot of cases, end up costing the organization more in management hours than the sponsorship is worth. Also, after a certain point, volume leads to a dilution of value for each sponsor, along with the unintended consequence of overwhelming and creating friction with the attendees themselves. For these reasons, Startup Weekend will pursue no more than 10 major sponsorships. Instead, a focus and strategy is under development to target high networth individuals and applicable grants. The metrics of success for Startup Weekend are often presumed to revolve around the number of successful teams directly emerging from the weekend events; however, the goals and true metrics of success for Startup Weekend have a lot more to do with the educational impact on and success of the attendees. Metric 1: Repeats - The number of “repeat” attendees, speakers, sponsors, mentors, etc. at second and subsequent city events. Startup Weekend continues to evolve and strive for higher impact in communities as events become more frequent. We rely on engaging given communities’ most experienced and passionate entrepreneurs to ensure that our events’ quality continues to increase, while assuring the sustainability and overall impact for the community. The standard number of “repeats” for second time or subsequent events currently is just above 25%. Metric 2: Satisfaction Scores - Every event is also followed by a quality control survey which measures attendees’ overall satisfaction and also captures other valuable data, outlined below. The key metric is to maintain a 95% satisfaction score (Startup Weekend events met or exceeded attendees’ expectations). Maintaining a 95% satisfaction rate requires increased event quality as higher percentages of repeats come to have expectations as to even execution, content, and value. Metric 3: Maker Ratio - A good balance of different types of attendees is key to the perceived success of an event and the overall outcome for each individual. “Makers” is the term we use to refer to the developers, designers and engineers who attend Startup Weekende events. For each event we strive for a 50% makers in order to ensure a proper mix of ideas, execution, ability, and creativity. Time and time again when we see this ratio out of balance on either side, the overall experience for all attendees is diminished. Running on fumes, passion, and the last pennies in their pockets, by 2009 the Startup Weekend Co-Directors had established something extremely disruptive and powerful; however, without additional support, continuing to grow or improve the organization would have been extremely difficult. In September 2010 Startup Weekend received a $400,000 grant from the Kauffman Foundation to help the organization build a sustainable infrastructure, scale to meet the ever growing demand, and to refine and improve the overall program. With the establishment and amazing progress of the new team, Startup Weekend is on pace to nearly double all of its key goals for 2011. Starting in November 2010, Startup Weekend began a program of surveying and data collection in partnership with the University of Washington. Timed to coincide with the Kauffman Foundation’s Global Entrepreneurship Week (GEW), 11 GEW Startup Weekend events were surveyed (US only). Participants were asked basic demographic questions as well as questions pertaining to their individual and group experiences and expectations during the weekends. The main takeaways from this survey are that Startup Weekend participants have significant experience in their industries of expertise. While they may not consider themselves full time entrepreneurs, they are not novices to the world of startups. Most Startup Weekend attendees are highly educated and have full time jobs, which suggests that they are exploring entrepreneurship as a way to transition out of more traditional business environments. Startup Weekend attendees see huge value in the events; in addition to being fun they also provide opportunities to work outside daily skill sets, meet new people, and learn the processes by which products and companies are built. Another trend that can be gleaned with regards to the evolution of an event within a community: with each additional event, the demographics increasingly attract more experienced and more serious entrepreneurs. Startup Weekend becomes a place for both great ideas and a high-impact experience for the communities’ most capable entrepreneurs, while remaining open to even the most novice and passionate individuals. The GEW survey campaign provided insight to the makeup of US-based Startup Weekend attendees. In an effort to better understand the global experience, Startup Weekend began sending out a post-event survey to all attendees, beginning in January 2011. An aggregate report, created in April, combined data from Europe, North America and Asia (with anecdotal reporting from MENA, Latin America, and Oceania). The key insight from this survey is that Startup Weekend has done an effective job in marketing and executing events. As an education-focused organization, Startup Weekend strives to provide an environment where entrepreneurs, regardless of their experience, can develop serious startup ideas and work alongside likeminded individuals across industries. The goal of a 50/50 split between technical and business participants has been realized and attendees are satisfied (or delighted) by 5 distinct opportunities provided at the events. In June 2011, Startup Weekend reached out to a database of past companies (self-reported) to assess “passive” job creation (as defined as jobs created by Startup Weekend companies or companies launched by co-founders who met at Startup Weekend events). Although preliminary, responses indicate that Startup Weekend is responsible for the passive creation of over 200 full and part-time jobs. If we conservatively extrapolate this data, we can assume an average of 3 jobs created per startup, with an estimated of 200 ventures within the survey group, that comes to a total of 600 new jobs created by (self-reported) Startup Weekend companies. Our lowest estimation (based on only 30 SW companies responding to our survey), shows a direct job creation last year of 82. The economical cost for the administration based on the best case number above from Jared Bernstein of $92,000 cost per job created would have been approximately $7.54M! This would be more than 6 times the grant from the Kauffman Foundation. Again, this is the most conservative estimation we can make as it’s only a small subset of the successful companies emerging from Startup Weekend. Another aspect that is nearly impossible to track is the indirect impact we have on individuals in the form of job transitions, co-founders launching other companies after the weekend, and thousands of networks that lead to value for the community and ultimately the economy. We can confidently estimate that over 600 jobs have been created both directly and indirectly out of Startup Weekend events over the past 2.5 years. This is why we are currently building a platform to track direct and indirect job creation by Startup Weekend to help track and produce quality data pointing to these amazing results. The main takeaway from this survey is that Startup Weekend is a legitimate place for serious entrepreneurs to share ideas and work together on viable business projects. While most Startup Weekend participants are coming for a weekend-long educational experience, for those attendees who are looking to meet a co-founder and get started on a serious business concept, Startup Weekend is an ideal place to gain momentum. Startup Weekend plays a substantial role in developing healthy ecosystems that support the creation of new startups and ultimately, new jobs. Startup Weekend will continue to solicit and improve the level of feedback regarding job creation. While this is not a core focus of the organization, it is a metric that is certainly worth tracking and understanding on a more fundamental level. At all levels of the organization, from Startup Weekend employees to the Board of Advisors to organizers and attendees, all believe that entrepreneurs and the startups they create are the keys to a healthy and robust economy. By checking in with established and new startup ventures, Startup Weekend can not only track job growth but can also identify which geographic areas and industries are most conducive to startup growth. Despite Startup Weekend’s rapid growth, there remains an insatiable global demand for more events. More new cities, new global and regional events, more verticals, more robust technological systems, a more formal curriculum, and more support pre and post weekend. Currently, Startup Weekend is only able to service about 71% of the organic demand for new events. Within the development of new verticals, there lies the potential to establish Startup Weekend vertical-specific events in all of the existing communities with up to 4-5 events per year. In addition to new events their exists the need to establish more robust data collection and online solutions to enhance research opportunities and the value given to attendees before, during and after an event. - Open Source, online Ecosystem Mapping and Startup Tracking:~100 communities mapped with ~5,000 startups with active tracking. Startup Weekend is far larger than any single person or group of entrepreneurs. The passion and energy that surrounds Startup Weekend will forever be both owned and controlled by engaged, problem-solving people around the world. As we continue to grow and evolve we will never forget our bootstrapping roots. We will also remember to practice what we teach, which means that customer validation, pivoting, and holding fast to Lean and Agile methodologies will always remain deeply held practices. Most importantly though, it means that although we’ll be working hard, we’ll always be having fun! If you or anyone you know wants to get more involved with Startup Weekend or might be able to support the organization and it’s efforts, please let us know. Join our global community of entrepreneurs, organizers, and supporters. We can guarantee that you’ll not only learn a lot, but that every ounce of energy you put into Startup Weekend will result in an exponential benefit to your startup community. The hudreds of Startup Weekend organizers, facilitators, speakers, mentors, sponsors around the world.